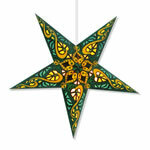 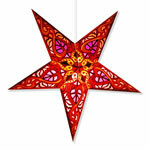 Wholesale paper star lanterns at the best prices anywhere! 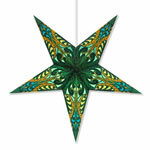 We have a no-questions-asked return policy. 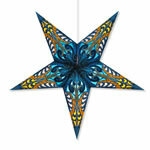 If you wish to return anything from your paper star lantern order for any reason, simply send back your paper star lamp to us in good condition and we will promptly refund your money. 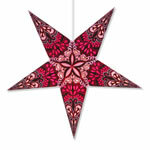 Hydra red 5 point paper star lantern. 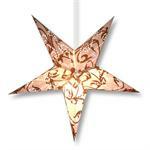 Paper star lantern with white tissue paper covering cutouts. 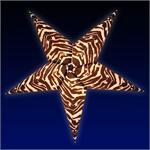 5 point white star with gold glitter. 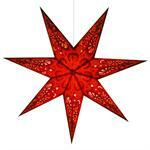 5 point space gray star lantern with white outline and white tissue paper. 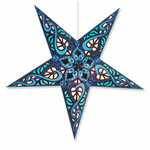 5 point space turquoise star lantern with white outline and white tissue paper. 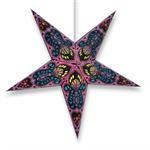 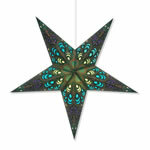 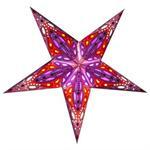 Athena design 5 point paper star lantern in purple. 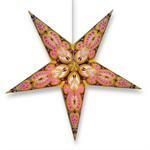 5 point star light with tissue covered cut outs. 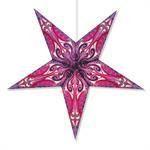 Peacock design 5 point paper star lantern in pink. 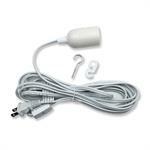 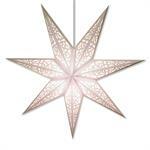 Purity Swirl 5 point paper star lantern in white.